I am not usually this extravagant, but I currently use both these foundations, depending on what time of the day it is, and where I am going. I wanted to post a little review and comparison here, for my own benefit, and for anyone out there who's looking to buy either one of these. This foundation is pretty pricey, but it provides excellent coverage and disguises my pores pretty well. It picks up light really, really well, so you have to be sure to apply this evenly all over your neck as well, or risk looking a little clownish. I have tried a few different methods of application with this foundation - a beauty blender, a foundation brush, a kabuki brush, and plain old clean fingers, and surprisingly, it applies pretty evenly no matter what tool I use. This foundation is really amazing if you love that dewy, fresh-faced look. I can't rave about this enough! The end result is a beautiful dewy, moisturized, healthy glow. The result is really nothing short of amazing. One gripe I have about this foundation is that it tends to be a little on the dry side, especially around my nose area, so I have to use a primer if I want that perfect dewy look all over. This foundation comes it quite a large array of shades, and it's pretty easy to match your skin because the colours posted on the website stay pretty true to the actual colours of the foundation. That having been said, I highly recommend trying out shades at your GA counter or purchasing samples first if you're ordering online, because this foundation is not very forgiving on mismatched face shades. This is my go-to foundation for the daytime because of its spf (even though I apply sunblock underneath my foundation anyway). 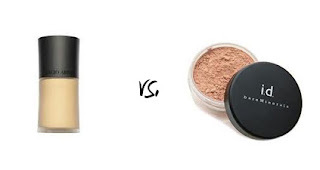 The beauty of powder mineral foundations is that it can be built up according to how much coverage you need. I usually only need to buff the foundation over my face about twice, then pick up some of it with my concealer brush and go over problem areas. It covers really well, and doesn't look fake. This foundation has a more shimmery finish vs. the dewy finish that the GA foundation provides. My skin looks natural and quite matte under natural light, but very slightly shimmery under any other kind of light. This foundation photographs beautifully if you're looking for a subtle shimmery glow. Getting colour matched on the Bare Escentuals website is quite the experience! The website is quite detailed, so you'll definitely get a suitable foundation. Don't worry about mismatching your shade slightly - this foundation is pretty forgiving and blends into your skin pretty nicely. On my first try, I purchased a foundation that was a shade too light, but it didn't make a difference at all unless I was using a silicone-based makeup primer, which I did once. The effect wasn't too clownish, but I did look a little white in pictures. I've taken a couple of pictures to hopefully illustrate the difference in the foundation finishes. The ones with the blue eyeshadow are pictures of the GA foundation. Photos were not edited, so it's easier to tell the difference. The same bases were used underneath the foundations, and nothing was layered over them.